The Tiffen 52mm Close-Up Lens Set is a set of three close-up lenses for use in achieving macro-like results with almost any lens you pair them with. Close-up lenses are essentially diopters that you place over your lens in order to lessen the minimum focus distance by the amount specified on the filter. You can combine the filters together to increase their strength and to fine tune your close-up settings. These filters are constructed from premium ColorCore glass for optical clarity and feature an aluminum filter ring with dual threads for ease when combining with other filters. These filters decrease the minimum focus distance of any lens, providing macro-like results. +1, +2, and +4 strengths allow you to vary and modify your desired close-up amount. Dual threading permits you to combine the filters together or pair with other types of filters. Box Dimensions (LxWxH) 2.9 x 2.8 x 1.3"
52mm Close-up Lens Set is rated 4.6 out of 5 by 22. Rated 4 out of 5 by Patrujo from Pretty, pretty good I bought this as a gift for my girlfriend's mother who like to take pictures of insects but can't get close enough with her kit lens. I tested them and they are really very good if you don't want to invest in a true macro lens. I would give them five star but noticed that the plastic wrap that each lens is packaged in had left very slight marks on the surface. It was noticed when there was a bit on condensation on the front. I didn't have my lens tissues there ,but it probably would have cleaned up easily. It was very slight and didn't affect picture quality. Rated 4 out of 5 by Lely from Its good because its cheap Good little lenses, better use them with a tripod, to shoot some short-take closes, but its effective if you have a camcoders without pro lenses, like a good telemacro, so you can swing out the minimum distance focus problem with these lenses. Rated 5 out of 5 by Anonymous from GREAT LITTLE SET OF LENSES Haven't had a great deal of time to use these but all 3 have worked beautifully. Have a large garden with very interesting flowers and their associated insects and bugs. These work great at capturing these. Looking at a bee covered in pollen or a spider spinning its' web, are captured brilliantly. Glad I bought these. Rated 5 out of 5 by Ace from Great Intro to Macro Photography Great addition to anyone on a budget looking to get into macro photography. I've been very pleased with the results. Actually, won a photo contest with a shot taken with the +4 lens! The case they came in was an added bonus. Rated 5 out of 5 by Dave from A Fix for Reading Glasses I actually purchased this set to use with my Sony EX3 viewfinder. I screwed one onto the viewfinder so I no longer need my reading glasses when I shoot with the camera. are these close-up lens multi element, multi coated? 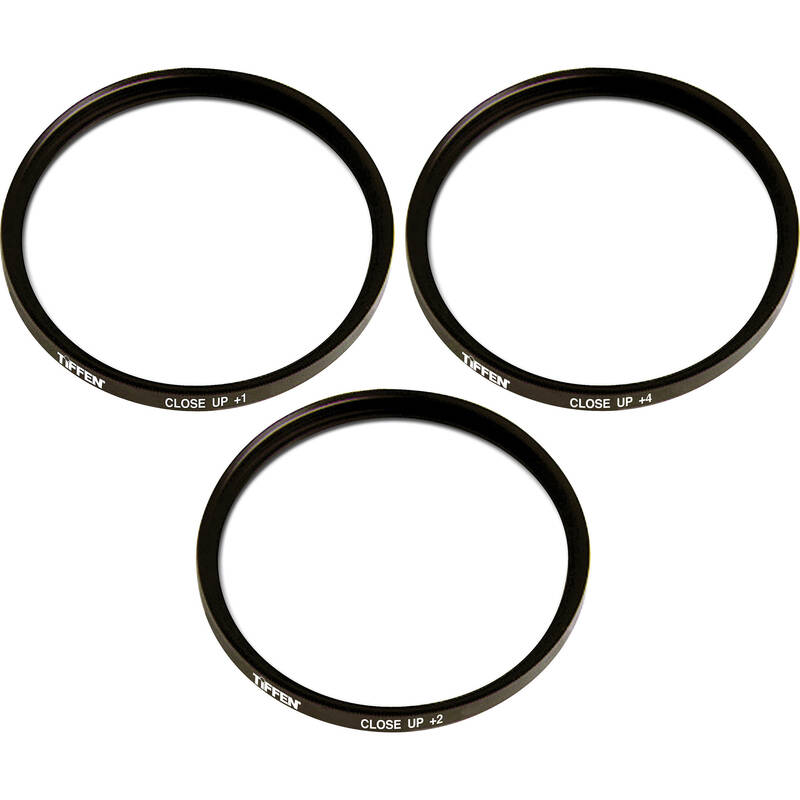 The Tiffen Close-Up Lens set filters are not multi element or multi coated. What is the difference between close-up lenses and extension tubes? Is one better than the other for close up work? Close-up lenses are for use in achieving macro-like results with almost any lens you pair them with. Close-up lenses are essentially diopters that you place over your lens in order to lessen the minimum focus distance by the amount specified on the filter. You can combine the filters together to increase their strength and to fine tune your close-up settings. We do not manufacture extension tubes.